Autotrader is an Internet-based marketplace where car buyers can shop from thousands of advertisements, both from dealerships and private owners. The website was founded in 1997, and is headquartered in Atlanta. Autotrader is part of the AutoTrader Group, which also operates Kelley Blue Book and several other automobile software services. 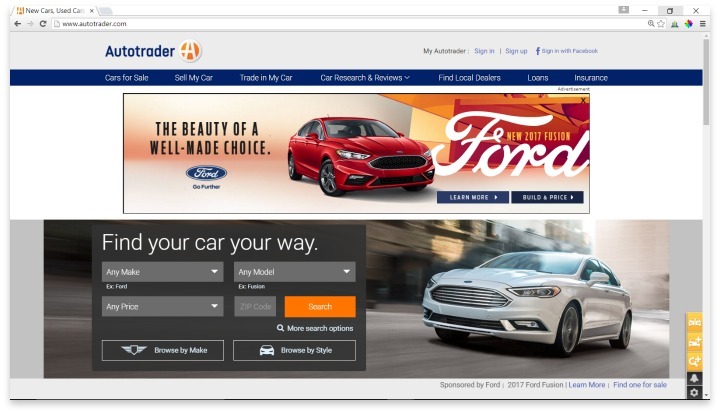 When car shoppers go to Autotrader, they can see advertisements from private individuals, as well as dealerships, who want to sell new and used vehicles. Viewing these advertisements is free, and they generally include pictures, driver reviews, and safety information, as well as manufacturer specs and prices. AutoTrader doesn’t gather its own consumer and expert reviews; rather, they import them from Edmunds.com and other similar websites. This is good news for buyers, because Edmunds.com is well-known for providing accurate information and good reviews from expert mechanics. AutoTrader does, however, provide information on local dealerships, local insurance agencies, and even places where buyers can apply for auto loans in their area. AutoTrader is the route through which Edmunds.com lists vehicles for sale, so it makes sense that the two services would be closely intertwined. AutoTrader’s prices for advertising a used vehicle run from $26 to $70, depending on the length and the number of images a dealership or seller wants to include. While AutoTrader is pretty much limited to simply ads of vehicles for sale, lacking any sort of comparison feature or other nifty informative features, they do have one thing that almost no other car sales website offers: a mobile app. You can search for listings on any mobile device, contact the seller, map out a location using your phone’s map app, and save information within the app that you can then access from the computer later. Being largely focused on sales of vehicles, AutoTrader does offer tools to help consumers consider the affordability of a vehicle. There is a calculator to estimate your credit score, and you can match your credit score to local dealerships who are willing to work with someone of your score. AutoTrader also has a knowledge section on getting the right financing, improving your credit, and understanding loans. AutoTrader’s website is very clean and easy to use, with no cluttering advertisements, and plenty of navigation options laid out in an easy-to-read format. They do have a FAQ section for help, and both a telephone number and an online contact form for extra help. Search results are very inclusive, and in general the website offers only the help you truly need, with nothing to get in the way. Autotrader is an online marketplace where car buyers can shop from thousands of advertisements, both from dealerships and private owners. If you are looking to sell your car, AutoTrader is definitely the place to go. You’ll get exposure on Edmunds.com, which is the number one place that shoppers go, and you’ll find it easy to set up your advertisement. It’s far more reputable than something like Craigslist, and there are several tiers to fit your budget. Shoppers, you are probably better off sticking with Edmunds to get more shopping comparison features, unless you already know exactly what you want and are just looking for the best place nearby to buy. Have you had an experience with this company? Please share your Autotrader reviews below.